I had a question of a colleague to have a look at a statement that didn’t really perform. So I had a look and tried to explain afterwards how my mindset worked during solving the problem at hand. I post it now here as well hoping it might help others. As once somebody mentioned, “every database is unique”, and in this case mine is probably as well, but I can layout the general steps. First its probably good to know that when dealing with this SQL/XQuery, it referenced a table with more than 10 million XML documents in a column. Be aware, its all about context. In the context of “XML”, updates or content driven query statements will become very performance intensive. Choose the correct XMLType storage / datatype. If you pick the wrong storage (datatype) for storing XML, you will get into (performance) trouble. Mentioning “In-Memory Column Store Database functionality“, of course after choosing the proper storage you will have to provide / create indexes to support your statements and DML. Oracle created, based on customer experiences, a second whitepaper that will provide you with a lot of information on the “how/what and where” when dealing with or creating XML Indexes. On this website there is also a XML Content page with multiple posts about this subject which will provide you with some shortcuts. Support your queries with the proper XML Indexes, eg. In the case of XMLType Object Relational, if created by Oracle by default, multiple indexes will be created to maintain the references between the structures (nested tables, varrays, etc) that are needed to uphold the XML structured defined by the used (registered) XML Schema. In case of using, for example, XMLType Securefile Binary XML storage, you will have to created the needed XMLIndexes for support on semi-structured or structured data, yourself. If needed with additional Oracle (XML datatype aware) Text indexes for unstructured XML content. In my environment, we make use of a XMLType Object Relational defined column, restricted by a database registered XML Schema and were needed added with extra supporting indexes on the element or attribute values. The information given above was needed to give you some context on how to deal with the following and its results and how it may or differ in your situation. The example given is a solution. With so many ways of actually making use of XQuery, XPath and SQL, there might be multiple ways (mix) of dealing with the problem. It really “all depends”… BUT hopefully you can apply / follow the some or the same outlines to create a (performance) satisfying result. As hinted a bit before, there are multiple “storage metadata” definitions due to this “Super/Uber XML Schema” setup. One of those is “dossierred”. From the in total (currently) 10.875.688 XML documents in table IC_METADATA, column METADATA (XMLType OR), of those, 403.977 are defined “dossierred”. The statement tries to find the maximum “publicationnr” (number) in those “dossierred” XML documents where the “code” attribute matches string ’92’ (defining specific “dossierred” content), but only where the “publicationdatum” (date) is in the year 1964. As most of you already expected a conversion operation before the equality sign instead of afterwards, is not a good idea and forced the database to do a full table scan on IC_METADATA. 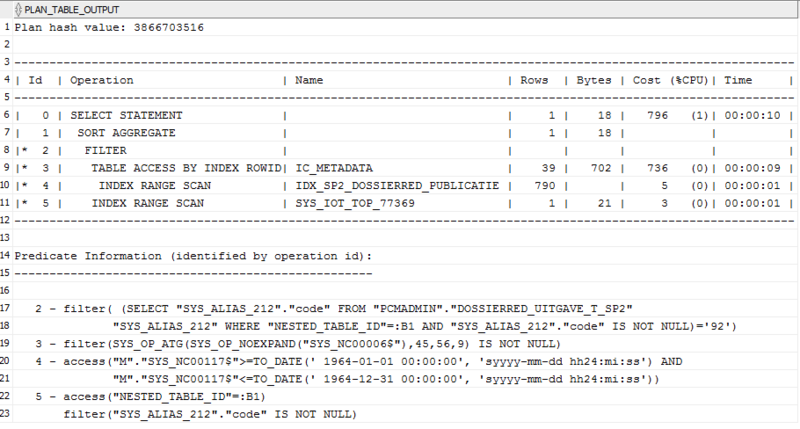 For the XMLDB savy amongst you, you also will notice the use of index organized table info (IOT). This is due to using the IOT option in the DBMS_XMLSCHEMA.REGISTER_SCHEMA (parameter OPTIONS / “REGISTER_NT_AS_IOT”). This is nowadays not the default anymore as it once was. Check, if needed, the Oracle XMLDB Developers Guide for your database version in use. Don’t use deprecated functionality (if not really really necessary)! After fiddling a while with the initial statement, I came up with the above statement. I need XMLEXIST to filter on XML Schema based “dossierred” sections only and I want to use XMLTABLE to get the values for “code“, “publicatienr” and “publicatiedatum“. 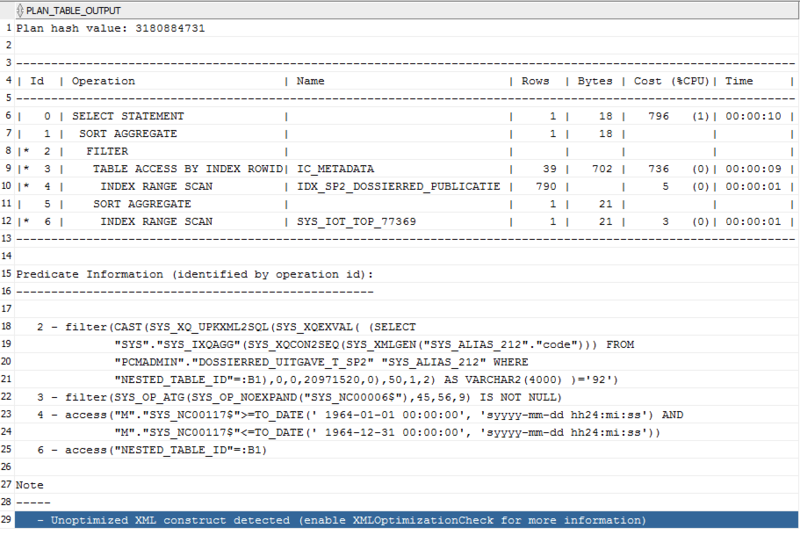 XMLEXIST has been used to filter on those XML Schema based XML “dossierred” XML instance sections. Every time you use “XMLTYPE”, and Oracle is not able to avoid unnecessary use, via re-writing and other means of dealing with optimization of the statement, the database will check the XML content for XML well-formed-ness. The bigger the (intermediate) XML content, the bigger the amount of checking/parsing effort needed. I guess you can imagine, if the XML instance or intermediate result is big, let’s say 10MB in size, that this also comes with a nasty CPU drain/usage and PGA memory consumption. So if not needed, avoid it. Keep intermediate results small to be efficient regarding CPU and PGA, use. Awesome, you might say? Cost went down from initially 860477 to 796 so that is very promising regarding performance. There is this annoying “Unoptimized XML construct detected” remark though. The filter operation in 2 showed a extensive ugly cast. So I checked the data specification of the COLUMNS section in the XMLTABLE function. In the case of XMLType Object Relational storage, column datatype specification is already know due to the created database objects in the database defined by its used / registered XML Schema. The trick I use here, is to temporarily remove the datatype specifications in the XMLTABLE COLUMNS section and use the remaining in a “CTAS” statement. This way, the database will create the appropriate column and datatype specifications, needed in the COLUMNS XMLTABLE section. Alas, the overall cost figure keeps the same (796), so it looks like the CAST effort done in the XMLTABLE section is cost effective the same as if done in the SELECT section. Can we improve by being more specific in the filter XMLEXIST section… Let’s try and filter via the “code=’92′” using it in a XPath bind variable. It might not be much, but cost figures improved a bit and shows now 794 instead of 796. This is due to the fact that Oracle can make use now of both secondary indexes, the one on “publicatie” and on “uitgave”. 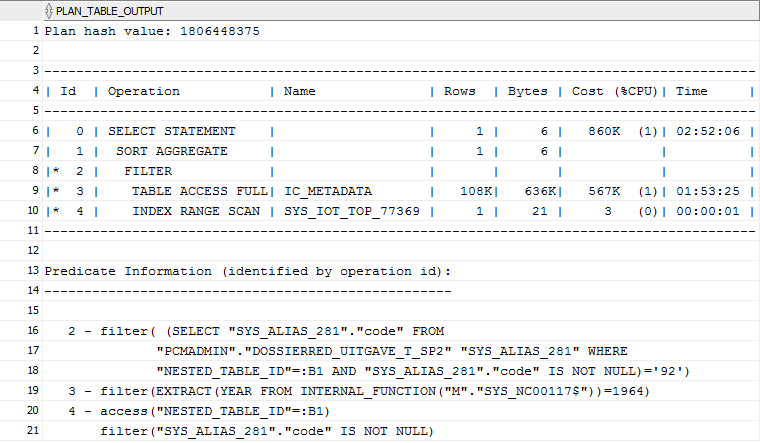 Full table access / index access on IC_METADATA has now almost avoided.